Based on 2017 EPA mileage ratings. Use for comparison purposes only. Your mileage will vary depending on how you drive and maintain your vehicle, driving conditions and other factors. Call Egolf Brevard at 828-884-4151. You make the drive, well make the deal and youll feel like family! The redesigned 2015 Ford F-150 may not look all that different, but those familiar lines disguise what is unquestionably the most sophisticated and capable version of this best-selling pickup ever to hit the road. The 2015 Ford F-150 has been fully redesigned. Strong power and excellent fuel economy from turbocharged gasoline V6 engines; impressive payload, towing and off-road capabilities; long list of advanced comfort, convenience and safety technologies. In the face of brand-new full-size pickup models from its major competitors, Ford figured it needed to do some truly radical rethinking for its 13th generation of America's best-selling line of full-size trucks. And, from early indications, it looks like the company has managed to do just that with the 2015 Ford F-150. You won't know how radical the new F-150 is just by looking at it. In a nod to the conservative tastes of many pickup buyers, Ford kept the styling changes fairly subtle. The restyled grille and distinctively shaped headlights are the most obvious visual clues that you're looking at an all-new truck. Instead, the really big changes are largely hidden from view. Ford engineers have made extensive use of lightweight aluminum in everything from the hood and body panels to the pickup bed to help shave off as much as 700 pounds of weight in the process. Lest you think aluminum is synonymous with flimsy beer cans, Ford says that the military-grade alloys used on the F-150 come in a wide variety of different thicknesses, many of which can be tougher than steel at a fraction of the weight. Underpinning it all is a full ladder-reinforced frame that uses significantly more high-strength steel than the outgoing model. Advantages to shedding weight are multifold. For a given GVWR (gross vehicle weight rating), a lighter truck can handle more payload. The same relationship applies to GCWR (gross combined weight rating) and towing capacity. And a significantly lighter truck will accelerate more quickly and burn less fuel. Efficiency is so good with the truck's new 2.7-liter turbocharged EcoBoost V6 engine that the two-wheel-drive F-150's combined fuel economy rating of 22 mpg just misses the combined 23 mpg delivered by the more expensive diesel six-cylinder powering the class-leading Ram 1500 EcoDiesel. Of course, Ford is looking to keep traditional truck bragging rights as well, and it says a properly equipped F-150 will be able to tow up to 12,200 pounds with the 2.7-liter's bigger counterpart, the 3.5-liter turbo V6. Ford has also packed the latest F-150 with even more advanced technology. There are video cameras galore, including a trailer hitch assist version that features a dynamic guide line to make lining up the hitch ball and trailer coupling a quick one-person job, as well as an available top-down 360-degree camera view system to help with navigating parking lots and job sites. Other highlights include a new 8-inch "productivity" screen in the gauge cluster and a host of new safety features, including lane-keeping assist and adaptive cruise control. With the seemingly endless number of permutations, there's probably a 2015 F-150 model to suit every person who has ever even thought of buying a pickup. Just the same, there are other trucks you'd be well advised to check out. We're also very fond of the 2015 Ram 1500, which will impress you with its smooth ride, quiet interior and available diesel engine. You can't discount the 2015 Chevrolet Silverado 1500 either, considering its well-rounded nature. Both are great trucks, but we think the redesigned 2015 Ford F-150 has enough meaningful improvements to make it a very attractive choice for shoppers. Bottom line: If you're looking for a thoroughly modern full-size pickup in 2015, Ford has just made your decision that much harder. The 2015 Ford F-150 is a full-size pickup offered in regular, extended (Supercab) and crew cab (Supercrew) body styles. There are three bed lengths: 5.5 feet, 6.5 feet and 8 feet. The new F-150 is also available in five trim levels, including XL, XLT, Lariat, King Ranch and Platinum. Standard equipment on the entry-level XL model starts with 17-inch steel wheels, air-conditioning, cloth upholstery, a 40/20/40-split front bench seat, 60/40-split rear seats (extended and crew cabs), a tilt-and-telescoping steering wheel, manual mirrors and windows, manual locks and a four- or six-speaker sound system with a 4.2-inch display and four speakers (six speakers in crew cab models). The main option for the XL is Equipment Group 101A. That includes the XL Power Equipment Group that adds automatic headlights, daytime running lights, power mirrors and windows, power door and tailgate locks and keyless entry. Also part of the 101A package are cruise control, a 4.2-inch information display, Ford's Sync voice control and smartphone integration system, Bluetooth phone and audio connectivity and USB and auxiliary audio input jacks for the sound system. There's also a long list of stand-alone options that include appearance packages, skid plates, running boards, tailgate and box side steps, a spray-in bedliner, an integrated trailer brake controller, a power-sliding rear window, a rearview camera, a CD player, satellite radio, rear parking sensors, different axle ratios and towing packages. The next step up is the XLT trim level, which adds the content of the 101 package plus 17-inch alloy wheels, foglights, chrome exterior trim and extra interior storage. Option groups on the XLT include a 301A package that adds heated mirrors, driver-side and rearview auto-dimming mirrors, a rear window defroster, a Class IV trailer hitch, an eight-way power driver seat (with power lumbar), a leather-wrapped steering wheel, power-adjustable pedals, rear under-seat storage, a rearview camera and a seven-speaker sound system with satellite radio. A Luxury Option Group 302A adds to that with remote engine start, a power-sliding rear window, LED bed lighting, rear parking sensors, heated 10-way power-adjustable front seats, 110-volt household-style power outlets and the MyFord Touch interface that includes an 8-inch central touchscreen display. Noteworthy stand-alone options on the XLT (besides the XL options listed above) include 20-inch alloy wheels, power-adjustable heated mirrors, mirror-mounted LED spotlights, trailer towing mirrors, the FX4 Off-Road package, a fuel-economy boosting SFE package, a sunroof, front bucket seats with a center console, inflatable rear seatbelts, a blind-spot monitoring system with rear cross-traffic alert, Crew Chief fleet-based telematics and a navigation system. The upscale Lariat is similar to the XLT with the 302A package but also includes dual-zone automatic climate control, an 8-inch gauge cluster information display, leather upholstery, ventilated front seats, driver seat memory settings and keyless ignition and entry. Many of the XLT's stand-alone options are also available for the Lariat. The Lariat's 502A package goes all out with LED headlights and taillights, automatic high beam headlight control, second-row heated seats (crew cabs only), a heated and power-adjustable steering wheel and a 10-speaker Sony audio system. On the Lariat you can also get the Technology package (lane-keeping assist and a 360-degree top-down camera display with dynamic hitch assist), power-retractable running boards, adaptive cruise control with frontal collision warning, and automatic parallel parking assist. The top-of-the line King Ranch and Platinum models share most of the above features along with higher-grade interior materials. Choosing between the two comes down to a preference for western flair or more sophisticated uptown styling. The 2015 Ford F-150's base engine is a 3.5-liter V6 that generates 283 horsepower and 255 pound-feet of torque. The next step up is the new turbocharged 2.7-liter V6 that produces a healthy 325 hp and 375 lb-ft of torque. Those needing more muscle for heavier payloads or towing can opt for the 5.0-liter V8 engine that's rated at 385 hp and 387 lb-ft or a turbocharged 3.5-liter V6 that pumps out an impressive 365 hp and 420 lb-ft of torque. Dropping so much weight with its new aluminum body was supposed to help vault the new-generation 2015 F-150 to the top of the heap in terms of fuel economy. It has, although in some F-150 configurations, the efficiency boost is comparatively modest. With so many trim levels and engines to choose from, there are several EPA estimates for the 2015 Ford F-150. Starting with the standard 3.5-liter V6, two-wheel-drive versions of the 2015 F-150 are EPA rated at a combined 20 mpg (18 city/25 highway); the same engine with four-wheel drive drops to a combined 19 mpg. These are basically the same ratings that you get from Chevy and Ram. Move up to the optional (but smaller) 2.7-liter turbocharged EcoBoost V6, and 2WD models yield a combined 22 mpg (19/26), while 4WD-equipped models with the same engine have a combined 20 mpg rating. During Edmunds testing, a 4WD SuperCab F-150 with the 2.7-liter engine went from zero to 60 mph in 6.0 seconds, while a 4WD SuperCrew with the same engine did the sprint to 60 in just 6.4 seconds. Both are impressive times for the segment. 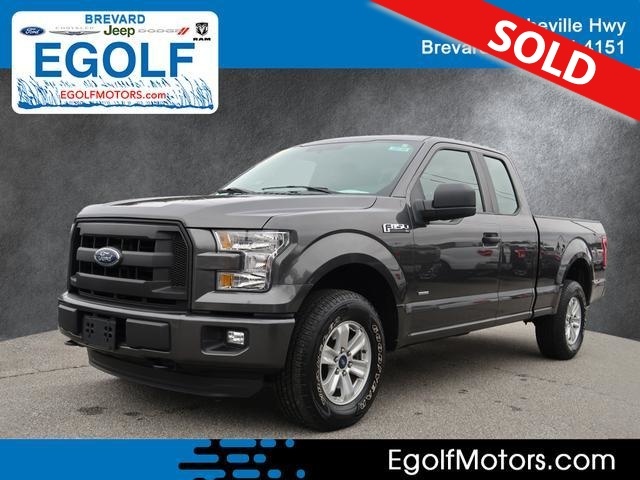 Get the 5.0-liter V8 and a 2015 F-150 with 2WD has a combined rating of 18 mpg; adding 4WD to models with the V8 drops the combined rating to 17 mpg. Finally, the 3.5-liter turbocharged EcoBoost V6 earns a combined 20 mpg (17/24) with 2WD and a combined 19 mpg in 4WD form. All four engines come mated to a six-speed automatic transmission equipped with both Sport and Tow/Haul modes. Rear-wheel drive is standard, and an electronically controlled four-wheel-drive system with a low-range transfer case is available as an option. Standard safety features on the 2015 Ford F-150 include antilock disc brakes, stability and traction control, trailer sway control, front-seat side impact airbags and full-length side-curtain airbags. In the event of a crash, the Sync system can use a paired cell phone to summon help from the authorities. Single rearview and 360-degree multi-view cameras are available, along with rear parking sensors. Advanced safety technologies including forward collision warning preparation (it primes the brakes for maximum effectiveness), a lane departure warning system and blind-spot monitoring with rear cross-traffic alerts. Inflatable rear seatbelts are also offered as an option. In Edmunds performance testing, a 4WD SuperCab F-150 with the 2.7-liter engine came to a stop from 60 mph in 126 feet, while a SuperCrew (also with 4WD and the 2.7-liter engine) stopped in 129 feet. Both distances are a few feet shorter than average for a full-size pickup. There's an unmistakable trend at work in the pickup world: turning these traditional workhorses into something more akin to gussied-up show ponies. Of course, work truck buyers can still get bare-bones XL models fitted out with vinyl floor coverings, roll-up windows and a simple AM/FM stereo. But the farther you go up through the trim levels, the nicer the furnishings and the more desirable the amenities become. This new F-150's interior has a classy look and feel, and materials used in those top trim levels are on par with a lot of upscale sedans. Everything in the interior is ergonomically designed in such a way that there's a padded armrest exactly where you'd want it, and frequently used controls are located right where your hand would instinctively reach for it. On the gauges front, the available 8-inch productivity display screen can be customized to show an array of other user-selected variables from off-roading info to tire pressures. Ford has also added a refreshingly intuitive center stack control layout with physical volume and tuning knobs and radio station presets logically arranged above similarly old-school knobs and buttons for the climate control system. It can make it seem like there are an awful lot of buttons, but this redundancy should alleviate any concerns you might have about operating the otherwise useful MyFord Touch touchscreen interface that's available on the upper trim levels. Front seats offer a commanding view and good comfort, especially the 10-way power-adjustable models with built-in heating and ventilation found in top trim levels. Rear seat passengers in crew cab models don't get much extra head- or legroom in the redesign, but the fact that the cab is 2 inches wider this year does mean everyone has a little more room to spread out. There's a fair amount of storage available, whether you choose the standard 40/20/40-split front seat with cubbies built into the folded-down center section, or front bucket seats separated by a sizable center console. Rear seats in both extended and crew cab models flip up to reveal hidden storage for valuable tools or toys. One of the first things you notice when driving the 2015 Ford F-150 is that it really does feel lighter, more agile and less-trucklike, you might say, than its predecessor. With the turbocharged 2.7-liter V6 under the hood, there's plenty of acceleration on tap and the brakes feels strong and solid. But if you want to upgrade, the V8 and bigger turbocharged V6 feel quite potent in this lighter F-150. The ride quality is relatively firm, which could be related to the new F-150's lightweight body and the higher payload it enables; the difference between empty and fully loaded has widened, so the rear suspension calibration necessary to shoulder the load can make an empty F-150 feel a bit bound up. Still, the F-150 is solid and predictable when driving around turns and it's quiet on long highway drives as well.